Celebrate summer bounty by visiting small family farms led by Wisconsin women committed to local agriculture and a healthy, fresh future for our communities. Visit us and other area farms for a tour. We’ll have soap, veggies, and plants for sale. 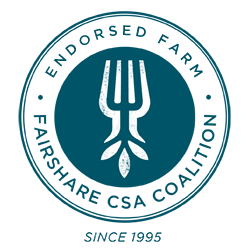 The tour highlights farms that employ organic and/or sustainable practices. You may visit any or all of the farms during this time period - there is no set schedule. Free to the public, attendees can learn more about FairShare and CSA, meet the CSA farmers, sign up for a CSA farm share and more! Approximately 35 CSA farms will have information, smiles and 2014 sign-up information. Meet your local farmers, find pick-up locations, learn about on-farm events, and choose your share! Meat, Veggies, Eggs and more! Volunteers needed to help cover crops and wind down the season.